-The best performances of the spring game on offense came from Casey Thompson, Jordan Whittington, and Kirk Johnson’s work on the ground. Thompson had 15 total carries for 42 yards and a score. Whittington had a team-high 62 yards on 12 carries. Because of the gusting winds, most of the best plays came on the ground for both teams. Thompson had ample opportunity to scramble because that seemed to be the only place the first-team defense gave the second-team offense yards. He didn’t have much help from the elements. Neither did Sam Ehlinger or any QB. The defense teed off as a result, and that was a beneficial outcome for that unit according to Herman. So work on the ground was necessary for the offenses Saturday, and that trio provided it. Thompson took a lick from DeMarvion Overshown on the game’s only score, while Johnson and Whittington had several solid runs. Johnson did leave the game favoring his wrist late in the game. Still, the work on the ground from those three was one of the offenses’ biggest highlights. -Whittington looked natural at running back. Not comfortable, but natural. According to Herman, he might look natural at anything. Texas made efforts to not only get Whittington the ball, but to do it in space from a variety of alignments. He lined up in the backfield, lined up in the backfield with another back, and split out wide. He caught four balls for 27 yards and almost had a touchdown reception if it weren’t for a great play from Joseph Ossai. Last year, Texas “formationed” success for Lil’Jordan Humphrey. There’s a good chance Texas “formations” success for Whittington as well. -Though the wind did affect Thompson’s passing ability, the lack of protection seemed to have more to do with his 9-for-23, one interception evening as the white squad’s QB. Thompson was under pressure from the first-team defense often, which lead to scrambles where he found much of his success on the ground. Once Thompson got behind the orange line, he went 5-for-8. 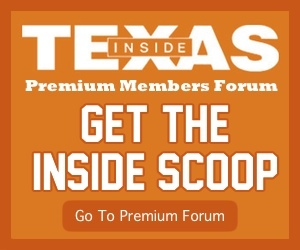 Herman has mentioned the second team OL as a concern this spring, and it once again was a concern during the spring game. It often started at the snap with Rafiti Ghirmai, who is learning the position, offering some poor snaps to Thompson that sometimes tanked the play. “Still a work in progress,” Herman said about that unit. 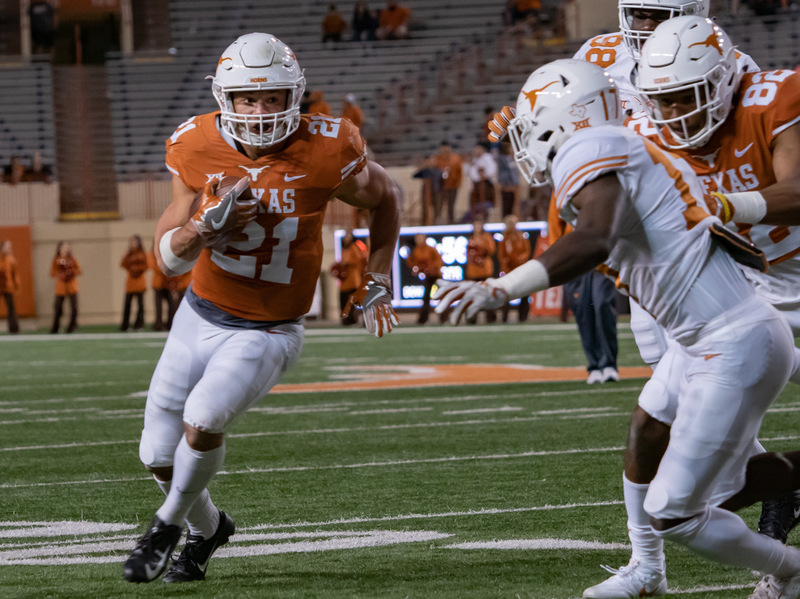 -Defensive miscellany: Jeffrey McCulloch intercepted Sam Ehlinger on a poor decision early in the game. Ehlinger let the RB leak out of the backfield, square up both middle linebackers, then make a move toward the flat. McCulloch followed the RB the entire time, read Ehlinger, made a play on the ball, and almost brought it back for a score. Kobe Boyce recorded an interception on a poorly thrown ball from Thompson. Both teams combined for 12.0 TFLs and 5.0 sacks. Scholarship players that got to the QB include Ossai, Ayodele Adeoye, Ta’Quon Graham, and Byron Vaughns. Ehlinger had to add a tackle on his interception. Marcus Tillman led Orange with 5 tackles, Montrell Estell led White with 6. Jalen Green had a standout performance, including a big hit and several pass breakups. Postgame, Herman emphasized the importance for Green to make physical plays like he did Saturday. “I think he’s taken that to heart,” Herman said of Green working toward adding more physicality. “I think he wants to improve that part of his game and you saw a little bit of that tonight. 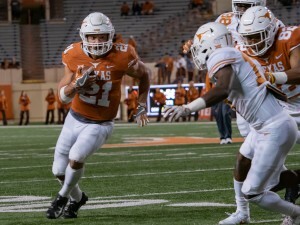 -In a game where plenty of third string and walk-on players got a considerable amount of action, Roschon Johnson’s snaps were limited in his first career spring game. It’s because he’s behind Casey Thompson in reps, on field play, and time spent at Texas. Johnson completed one of his two passes, and will compete with Thompson for the backup job come fall camp. He would say how pleased he was with his redshirt freshman.